Tad Hills is the author and illustrator of the highly acclaimed New York Times bestselling picture books Duck & Goose; Duck, Duck, Goose; Duck & Goose Go to the Beach; How Rocket Learned to Read; and Rocket Writes a Story. 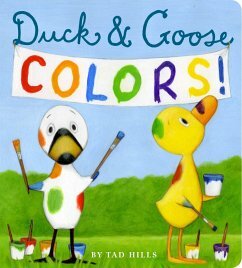 He has created numerous Duck & Goose board books, among them the ALA-ALSC Notable Children's Book What's Up, Duck? ; Duck & Goose, It's Time for Christmas! ; Duck & Goose, Goose Needs a Hug; and most recently, Duck & Goose, Let's Dance! The Rocket series includes a board book, Rocket's Mighty Words, and two leveled readers, Drop It, Rocket! and Rocket's 100th Day of School. Tad lives in Brooklyn with his wife, their two children, and a dog named Rocket. Visit the author online at tadhills.com.